According to recent study released by LIRNEAsia, India has highest gender gap in mobile phone ownership amongst 18 comparable countries and ranks among the lowest in women’s access to Internet. LIRNEAsia is an information and communications technology (ICT) policy think tank that is involved in pro-poor, pro-market research in Asia-Pacific since 2005. The study also included comparative research done by ICT Africa in Africa and DIRSI in Latin America. Only 43% of women in India own mobile phones compared to almost 80% of Indian males mostly because of lack of awareness. In India, 64% do not know about internet which is higher percentage than other countries except Pakistan and Bangladesh. Facial recognition technology will be used for the first time in Olympics-Tokyo 2020, to increase security around all venues. For this, games organisers have partnered with Japanese telecommunications and information technology giant NEC to develop the first system of this kind to be implemented at an Olympics games. The facial recognition technology will use IC chips within identification cards to automatically verify the identity of those entering over 40 sporting venues. This system will help to prevent fraudulent entry by people borrowing, stealing or faking an ID card. According to recent study, earth is at the risk of entering an irreversible hothouse condition – where the global temperatures will rise by four to five degrees even if targets under 2015 Paris climate deal are met. Hothouse Earth climate will in long-term stabilise at global average of 4-5 degrees Celsius higher than pre-industrial temperatures with sea level 10-60 metres higher than today. Currently, global average temperatures are just over 1 degree Celsius above pre-industrial and rising at 0.17 degree Celsius per decade. Government has doubled import duties on 328 textile products to 20% from existing rate of 10% under Section 159 of the Customs Act, 1962. Earlier in July 2018, Government had doubled import duty on over 50 textile products — including jackets, suits and carpets to 20%. The increase in duties will give edge to domestic manufacturers as imported products are currently cheaper. This move will also help to promote ‘Make in India’ as imports of these goods had surged drastically in last one year especially post GST. 29 inhabited islands in Andaman and Nicobar have been excluded from Restricted Area Permit (RAP) regime under the Foreigners (Restricted Areas) Order, 1963 till December 2022 by Union Home Ministry with an aim to increase footfalls and promote tourism. Government is also planning to open 11 other uninhabited islands to foreigners. The lifting of RAP will allow foreigners to visit these islands without prior permission from the government. The Telecom Regulatory Authority of India (TRAI) on August 7, 2018 integrated the TRAI Mobile Apps namely DND 2.0 and MyCall with UMANG Platform. This integration is part of the policy initiatives of TRAI that the authority has been undertaking over the years to protect the interests of the consumers to safeguard their interests. TRAI helps mobile phone users to rate their experience about voice call quality in real time and help TRAI to gather consumer experience data along with network data. UMANG launched on November 23, 2017, provides a single platform for all Indian Citizens to access pan India e-Gov services ranging from Central to Local Government bodies and other citizen centric services. 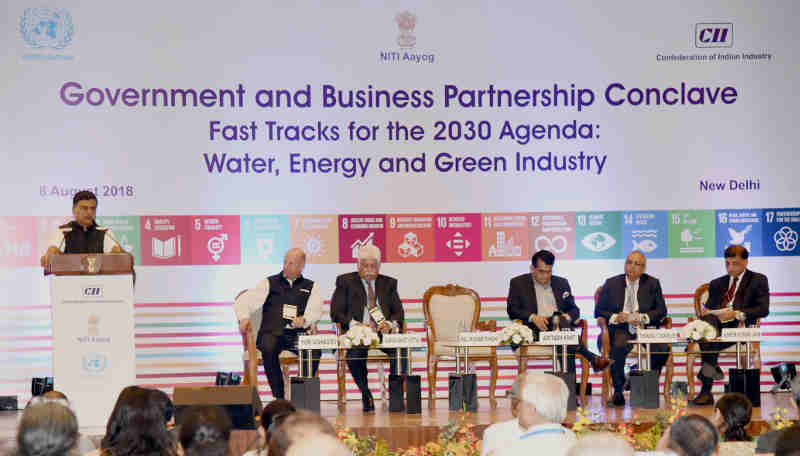 The Minister of State (I/C) for Power and New and Renewable Energy, Shri Raj Kumar Singh addressing at the Government and Business Partnership Conclave on Fast Tracks for the 2030 Agenda: Water, Energy and Green Industry, organised by the NITI Aayog, in New Delhi on August 08, 2018. The CEO, NITI Aayog, Shri Amitabh Kant and other dignitaries are also seen. The NITI Aayog and the Confederation of Indian Industry (CII) on August 8, 2018 signed a Memorandum of Understanding (MoU) on Sustainable Development Goals (SDGs) and entered into a three-year partnership. The MoU was signed during the Government and Business Partnership Conclave in New Delhi. The conclave was organised jointly by NITI Aayog, Confederation of Indian Industry and the United Nations. On the same occasion, the CII launched the report ‘Indian Solutions for the World to Achieve SDGs’ which explores and analyses each of the SDGs targets and business implications. The Supreme Court bench comprising Justices M B Lokur, S Abdul Nazeer and Deepak Gupta on August 8, 2018 said that it would constitute a committee under the chairmanship of its retired judge to look into the problems in jails. Attorney General K K Venugopal also agreed with the court on setting up a committee for jail reforms. He, however, told the bench that India was facing enormous problems in several other areas as well. The apex court stated that besides a retired SC judge as its Chairperson, the committee for prison reforms will comprise two or three officials from the Union Government. The committee’s duties will include looking into the problems of jails across the country including overcrowding and women prisoners languishing in cells for years. 1. Which country highest gender gap in mobile phone ownership according to LIRNEAsia? 2. In which Olympics Facial Recognition Technology is used for the first time? 3. How many islands in Andaman and Nicobar have been excluded from Restricted Area Permit (RAP) regime till December 2022? 5. When was UMANG launched? Will this be sufficient if I do this everyday for CLAT alongside reading the editorials?